This is a vintage 1940’s HAMILTON cocktail watch with a 14×34.5mm. solid platinum case which is encrusted with authentic diamonds. The bracelet is solid 14k. gold and also encrusted with authentic and sparkling diamonds matching quite finely. The dial is original and has acquired an attractive patina. The manual winding HAMILTON movement was just cleaned-accurate. 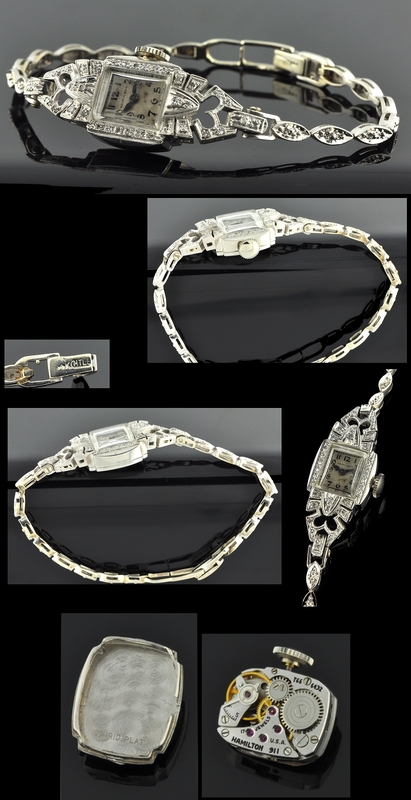 This attractive ladies watch will fit up to a 6.75 inch wrist. Just $1450.